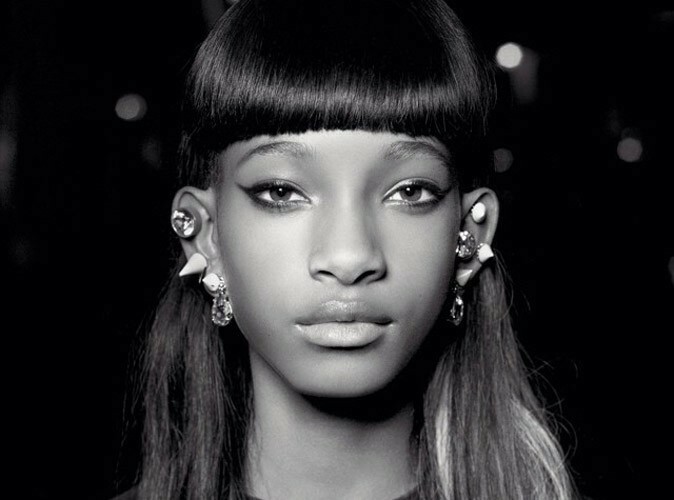 She was a pop princess at the age of nine and poised for movie stardom by 11, having been cast as “Annie” in an update of the beloved musical, but right now, just two days shy of her 13th birthday on Halloween, what Willow Smith wants to be more than anything is a seventh grader. Sitting on a velvet couch in her mother Jada Pinkett Smith’s luxe, earthy-chic office at Sony Pictures in Culver City, that’s exactly what she looks like, dressed in a purple vintage sweatshirt with flowers and butterflies on it, striped sweatpants and Doc Martens, her typically wildly colored and cropped hair now black with girlish bangs. These are big, heavy questions coming from one so young, but then it was her poise and self-possession that had everyone from Justin Bieber to Ellen DeGeneres smitten when “Whip My Hair” first dropped in 2010. Of course, her fearless, innate fashion sense didn’t hurt either. She hasn’t given up making music; it’s part of her daily life, particularly now that her brother Jaden is recording music and her mother has revived her band, Wicked Wisdom, which Willow describes as melodic heavy metal. But, perhaps after the to-do caused by her last single, “Summer Fling,” whose subject matter some felt was too grown-up, she says she wants to “keep it for myself.” Occasionally she’ll put something up on SoundCloud, like the song “Drowning” that she wrote and recorded with her friend Mecca, but she’s being patient and holding her cards close.